Japanese helicopter carrier Kaga, front, Japanese destroyer Inazuma, center, and British frigate HMS Argyll take part in a joint naval drill in the Indian Ocean, Sept. 26, 2018. Warfare exercises in the disputed South China Sea over the past two months reveal a sustained, long-term escalation of Japanese activity in a region where Tokyo has strategic interests that include keeping Beijing in check. In September a Japanese submarine, helicopter carrier and two destroyers explored the sea contested by six governments, with China the most militarily powerful. The exercise is part of a two-month initiative called Indo Southeast Asia Deployment 2018, designed to promote “interoperability with our partner navies,” the Japan Maritime Self-Defense Force says on its website. Then, on Monday, Japanese Prime Minister Shinzo Abe pledged to work with Vietnam on security in the South China Sea. Two days earlier his forces had held a beach-storming drill with their counterparts in the Philippines. 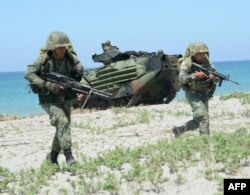 Philippine marines take position during an amphibious landing exercise at the beach of the Philippine navy training center facing the South China Sea in San Antonio town, Zambales province, north of Manila, Oct. 6, 2018. Japanese troops stormed a South China Sea beach in the Philippines in joint military exercises with US and Filipino troops that officials said marked the first time Tokyo's armored vehicles rolled on foreign soil after World War II. Japan lacks a claim to the South China Sea, a 3.5 million-square-kilometer waterway stretching from Hong Kong to Borneo, as Vietnam and the Philippines do. But it wants to keep shipping lanes and other resource channels open, while muting China’s growing control that includes artificial islands for military infrastructure. Tokyo, a U.S. ally, also vies with Beijing in a separate dispute over the East China Sea. “These exercises are going to become the new norm,” he said. 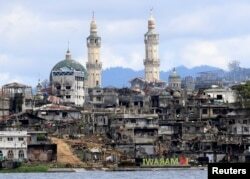 FILE - A sign that reads "I love Marawi" is seen in front of damaged houses, buildings and a mosque inside a war-torn Marawi city, southern Philippines, Oct. 26, 2017. Japan started intensifying ties in Southeast Asia, including to countries around the South China Sea, some 20 years ago as China began expanding its own economic relations in the same region. Japan has cut back its development aid to China since 1999 and raised the amounts given to Southeast Asia, some of it to build transport infrastructure before China does. About one-third of the world’s marine shipping traffic passes through the South China Sea, making it crucial to Japan’s acquisition of raw materials and export of manufactured goods. In the Philippines, Japan agreed in March to lend money to Manila’s first subway system. It has also helped rebuild Marawi, a Philippine city partly destroyed by civil war in 2017. “For the longest time Japan has been acting as a good friend of the Philippines in terms of the economy, and then reconstruction for instance in Marawi, so in a way I think one of the tactics of Japan is to maintain its friendly policy in the area,” said Maria Ela Atienza, political science professor at University of the Philippines Diliman. Last year Japan vowed to work closely with Australia, India and the United States to keep the sea open internationally. Japan hopes other countries agree on international maritime “norms,” said Stephen Nagy, senior associate professor in politics and international studies at International Christian University in Tokyo. Japan is expected to sustain its own missions in the sea so it becomes increasingly connected with coastal states. Brunei, Malaysia, Taiwan, Vietnam and the Philippines claim all or parts of the South China Sea but lack the economic or military clout that China has used to fortify its tiny islands over the past five to 10 years. In June Japan offered a $23 million grant to Indonesia for building ports on islands that face the South China Sea. Two years ago it extended loans and grants to the Philippines for patrol ships. A Japanese submarine visited Vietnam last month. Japan wants to help Southeast Asia, which in turn looks to Japan “as a counter balance,” Nagy said. “There’s a strategic partnership engagement, establishing their own security footprint within the region and forging a consensus on how international law should be obeyed by countries within the region, and it’s all targeted at China,” he said. China protested Japan’s submarine activities last month, saying they took place in waters that China claims. State-run news website Chinadaily.com said the mission “was testing one of China’s red lines.” China claims about 90 percent of the sea. But in the longer term China will try to build stronger Japan ties because it’s now sparring with the United States over trade, scholars expect. The U.S. government has approved import tariffs this year covering $250 billion in Chinese goods. China hopes to “turn down heat on Japan” because the United States is Beijing’s “biggest headache now” Kingston said. Japan for its part will engage China to show it can “smile and growl at the same time,” he added.